While taking care of our bodies, we often neglect the health of the human spirit and soul. Many health practitioners have found a defini­tive link between stress and disease. They’re increasingly saying that to be healthy, one must acknowledge the importance of spirituality. Countless people who have survived near-catastrophic experiences say that what got them through was using the “muscles of the soul”, those inner resources that help dismantle and transcend roadblocks on life’s journey. These roadblocks could be bad relationships, cancerous tumours, alcoholic parents or even a flat tire during rush hour. The muscles of the soul include courage, faith, humour, patience, compassion, imagina­tion, humility, forgiveness, intuition, creativity, optimism, honesty and love. They are what people draw upon in times of crisis and catastrophe. And they are not gifts for a chosen few. They are birthrights for everyone. But, like our physical muscles, they will atrophy if not used. We each have the potential to be spiritually healthy and to engage our spiritual muscles regularly. In times of change, which often produce stress, we need to be in good spiritual health, flexing these muscles and feeling the strength they provide. Be open to the possibility that there might be more to learn in life than already you know. Search for friends who challenge you to live a little better. Take time every day to be silent. 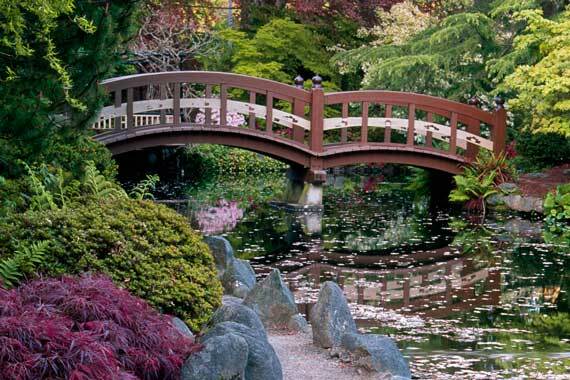 Visit UBC Botanical Garden for quiet reflection. When you hear something in the silence, examine it to see if there is any message of challenge or comfort in it. Figure out what you think and believe independently of what the media or friends tell you. Practise forgiving small slights or insults—they make you dwell on the negative. Seek out like-minded people who can support your spiritual fitness goals, and consider revisiting the faith back­ground you grew up with or your family is most familiar with. Be accepting of other people’s spiritual views.